This Certified Pre-Owned 2016 Honda Accord come in the EX-L trim. CARFAX 1-Owner, Excellent Condition, Honda Certified. PRICE DROP FROM $24,977, $2,300 below Kelley Blue Book! Moonroof, Heated Leather Seats, Satellite Radio, Aluminum Wheels, Back-Up Camera. CLICK NOW! Reduced from $24,977. This Accord is priced $2,300 below Kelley Blue Book. Leather Seats, Sunroof, Heated Driver Seat, Back-Up Camera, Satellite Radio. MP3 Player, Remote Trunk Release, Keyless Entry, Steering Wheel Controls. Honda EX-L with Lunar Silver Metallic exterior and Gray interior features a V6 Cylinder Engine with 278 HP at 6200 RPM*. 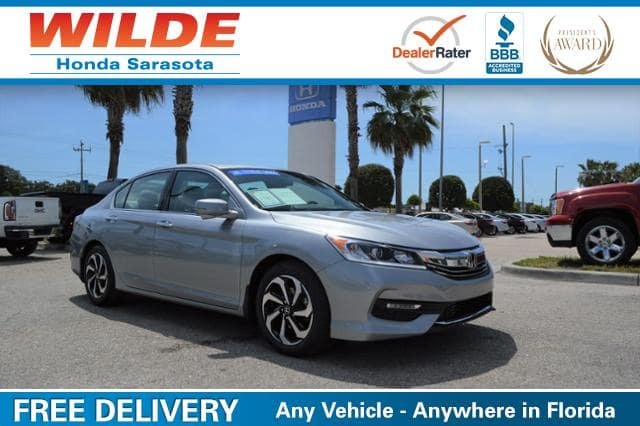 The Accord continues to impress with its responsive handling, composed ride, abundance of interior room, comprehensive feature set, fuel-efficient yet powerful engines and high crash test scores. -Edmunds.com. Pricing analysis performed on 9/27/2017. Horsepower calculations based on trim engine configuration. Please confirm the accuracy of the included equipment by calling us prior to purchase. After being in business for over 39 years we realize that MARKET VALUE PRICING is by far the best approach for our customers. We do not artificially inflate our pre-owned prices in hopes of winning a negotiation contest with our customers! We do not play pricing games. At Wilde Honda Sarasota we have won American Honda’s prestigious Presidents Award an area record 12 times! Our Wilde Honda Sarasota location allows us to serve as your New and Used Venice, Lakewood Ranch, and Tampa dealership resource.